I have not completed my Bead Journal Project piece for October, but at least I've gotten a good start. I'm not going to show you what it's going to become...you'll just have to wait till November, and hopefully I'll have been able to complete it by then. 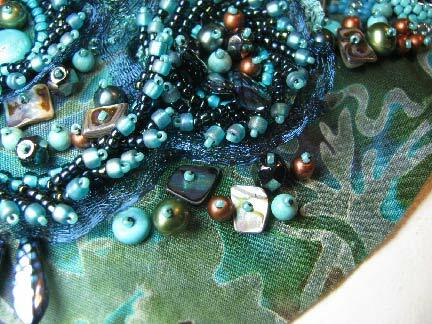 Shown above is a small section, featuring metal mesh ribbon from Fire Mountain Gems, Czech glass daggers from The Best Beads, and the embroidered form of St Petersburg chain stitch from Bored By Back Stitch. They are all beautiful but March is still my favorite...love those colors. Beads giveaway from The Best Beads! The World Wide Blog Hop! Shibori silk flowers and beads!